The breakfast rut has arrived. When it’s freezing outside, I’m less interested in cold foods like smoothies and cereal. I don’t even like to have salads for lunch. The thought of warm sweet potato parsnip latkes as a winter breakfast intrigued me. I’ve been trying to incorporate more vegetables into every meal (including breakfast), reduce my consumption of grains and eat foods that decrease inflammation in the body. Inflammation seems to be a better predictor of future heart problems than cholesterol levels these days. Enter these delicious crispy baked pancakes featuring root vegetables, onion and flax seeds (a great food to add to your diet if you want to reduce inflammation). Figure out how to use the grating attachment on your food processor and prepping the veggies will be a snap. 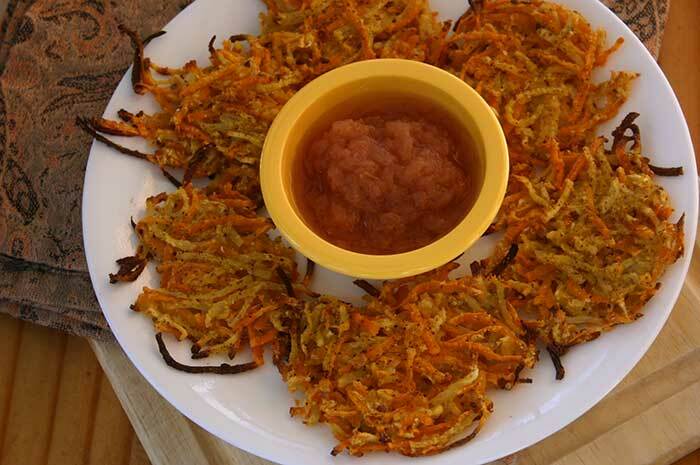 Serve these savory sweet potato parsnip latkes with homemade cinnamon applesauce or a little bit of plain Greek yogurt or sour cream if you aren’t avoiding dairy. No parsnips? No worries. Use any root vegetable that will grate well. I made my last batch with sweet potatoes, a single parsnip and a couple of knobs of kohlrabi. You should be able to find mirin, a sweet rice wine used in Japanese cooking, in the international/Asian section of your grocery store. If you would rather use ingredients you have on hand, substitute dry sherry, sweet marsala or dissolve 1/8 teaspoon sugar in 2 tablespoons of white wine. If you find you like the sweet potato-parsnip combination, check out Balsamic Root Vegetables made in the slow cooker. Make it gluten-free: Use gluten-free cornmeal. 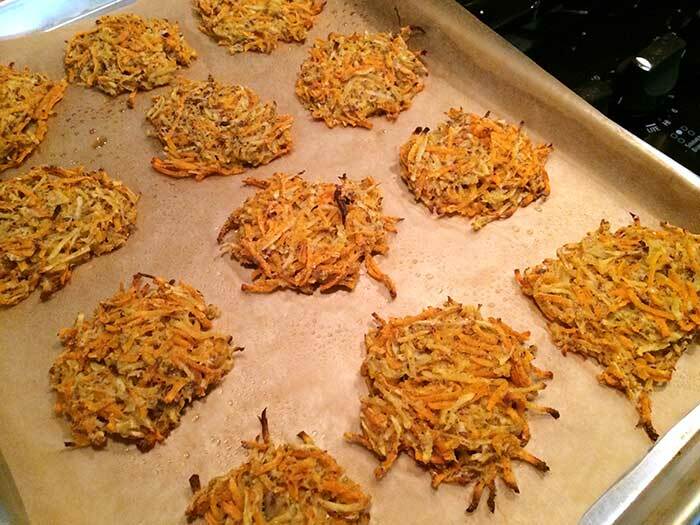 Make it ahead: Cook the latkes ahead of time, let them cool and refrigerate. They heat up amazingly well in the microwave, although they won’t be quite as crisp. If you want a crunchier texture, reheat them in the oven at 450°F for about 5 minutes. You can also freeze the latkes. After baking, let them cool and place the entire baking sheet into the freezer. Once frozen, transfer the latkes to a freezer bag. When ready to reheat, let thaw for 15 minutes, place on a baking sheet and bake at 450°F for 5 to 10 minutes. Place water in measuring 1-cup sized measuring cup. Add ground flax seeds and stir. Let soak for 10 minutes. Meanwhile, use the grating disc on your food processor to grate onion, parsnips and sweet potatoes (or grate by hand). Place grated vegetables in a large bowl and add mirin and soaked flax seeds. Sprinkle with cornmeal and salt and mix well with your hands. Line two baking sheets with parchment paper or silicone mats. Brush on some of the coconut oil. Use an ice cream scoop to put mounds of vegetable mixture onto baking sheets (10 mounds per sheet). Drizzle remaining coconut oil onto tops of each mound, sprinkle with pepper, then flatten with a spatula. Bake for 20 minutes, rotating pans halfway through, until edges look brown and crisp. Serve hot with applesauce. Nutritional information does not include applesauce. These look perfect! I have been looking for grain free breakfast ideas! !